30 Decorative Plates That You Can Create Yourself. Dinner plates might be functional, but let’s face it – they can be a little boring. When you host a dinner party, or just want to sit down and enjoy a fancy meal, why not have an equally-as-impressive plate to go with it? 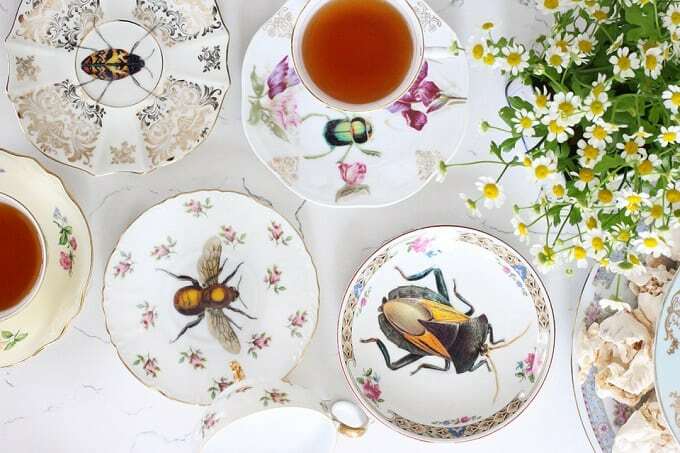 We’ve rounded-up 30 incredible DIY dinner plates to jazz-up your table setting and we have a feeling you’re going to love these! From pretty patterns to vibrant colors and just about everything else your mind can fathom – trust us, you’ll find it all here. It’s time to dust off those boring ol’ plates and give them a makeover with one of the following tutorials! Need a quick and affordable way to decorate your dinner plates for Christmas parties? 30 Minute Crafts has this wonderful Sharpie project for you! How gorgeous are these DIY patterned plates from A Beautiful Mess? We’re in love with that floral design! These colorful hexagon DIY dinner plates from A Kailo Chic Life are so fancy – we’d love to decorate our table with them! What colors will you paint yours? Love swans? A Kailo Chic Life has created these beautiful DIY plates with the bird motif on them. They’re perfect for dinner parties! Amanda Rollo will show you how to turn basic dinner plates into these DIY map versions. These are so special; you could easily create them as gifts for loved ones! Vintage floral plates are a dime-a-dozen at charity and thrift stores, so why not give one a monogram makeover? Angel in the North will show you how thanks to her step-by-step tutorial! Babble’s rose gold decorated plates are the perfect accompaniment to Thanksgiving and other special holiday feasts. You won’t want to miss this tutorial, as it teaches you everything you need to know to make your own! Let dinner time get a little bit spooky, thanks to these DIY Halloween inspired dinner plates from Boxwood Avenue. You’ll want to get them out every October! Abstract brushstrokes are so on-trend at the moment and Burkatron has created her very own DIY dinner plate version to jazz-up the table! You can let your imagination run wild with this one. Add some citrus zest to your dinner plates, thanks to this DIY tutorial from Crafting in the Rain! We love these lemon and lime versions. Down Home Inspiration has added a Christmas inspired touch to her dinner plates with this crafty reindeer design. You can easily create this too in time for the festive season! How great are these DIY Sharpie plates from Emma Courtney? They’re incredibly easy to make – you can knock them over in less than an hour! You can even add floral motifs to thrift store plates thanks to this helpful tutorial from Free Pretty Things For You! It’s as easy decoupaging them on. Gold, navy and nautical anchors come together to create these stylish DIY plates from Frog Prince Paperie! You’ll love making these fun designs. Plates that combine a vintage style with other on-trend antique-inspired elements have become popular of late – in fact, they’re selling for small fortunes on online marketplaces! Instead, we recommend you make your own by following this awesome tutorial from Honestly WTF! Add some stylish gold elements to your boring white dinner plates to make them worthy of being on the table at a special dinner party! You’ll learn everything you need to know from InStyle. This modern makeover for vintage plates is sure to turn heads! It’s also a lot easier to make than it looks, so be sure to check out the full tutorial from Lana Red Studio. These DIY sugar skull plates were made by Mark Montano, but he’s here to show you how to recreate them with a video tutorial! They’re not just perfect for Halloween, but all year around too. Speaking of spooky inspired DIY plates from Mark Montano, here’s another colorful version from the blogger! Which one do you prefer? We think we’ll have to make both designs! This Ikat inspired tableware DIY project is courtesy of Nouba! How beautiful are they? You can paint them in any color that your heart desires. Wow, we adore these DIY metallic plates from Nouvelle Daily, don’t you? They’re incredibly simple to create too. Oh So Beautiful Paper has made these DIY hand-lettered plates for special occasions – they’re stunning! You could literally write anything on these – place names, motivational sayings, you name it. These red polka dot plates were made by Simply Kierste and they’re a simple but stylish way to bring that festive feeling to your plain white plates. This DIY project requires little materials too! For those who want to add just a touch of color to their white dinner plates, this is the DIY tutorial for you! Studio DIY has added a vibrant rim around each plate – divine. Love watercolors? You can also add the look to your dinner plates, thanks to this DIY tutorial from Sugar and Charm. We’re head-over-heels in love with this idea. With some clear plastic plates and patterned fabric, you too can create these DIY dinner plates from Sugar and Cloth. The possibilities are endless with this one! Marble and gold – what a match made in heaven! Sugar and Cloth is the talented crafter behind this tutorial, so be sure to check it out. Sometimes, all you need is some vibrant confetti to bring fun and joy into your day. Sugar and Cloth agrees, so she’s created these DIY confetti patterned dinner plates using paint. Love them! The Party Girl was inspired by Kate Spade’s tableware range when they created these DIY dachshund plates. These are adorable! These fancy designs were easily created using porcelain pens! Find out how you too can create something similar by following the tutorial via Decorator’s Notebook. 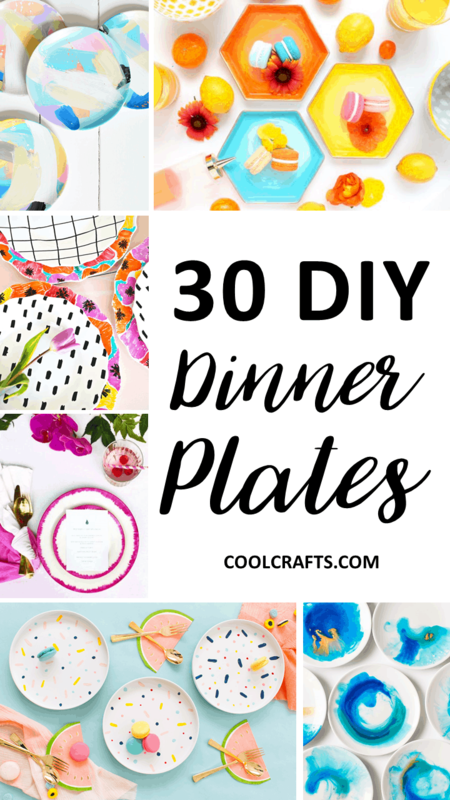 There you have it – 30 incredible DIY dinner plates that will instantly jazz-up your table! Which projects were your favorites? We’d love to hear from you in the comments section below!